THE GALAXY EXPRESS: "The Great BS Device"
As many of you know, during Science Fiction Romance Week at Spacefreighters’ Lounge, there was a discussion about “room for improvement” in SFR. Frances commented that I can get over the writer creating something that is impossible according to the known laws of physics, if, and only if, the writer presents it in good enough BS form that I can think "cool BS!" This generally presents itself in the form of 'faster than light' travel, and is fine. Space distances are just to[sic] great to traverse with the technology that we have now. What I can't handle, and pulls me right out of the story, is a planet being described which *ABSOLUTELY CANNOT* support human live[sic]. A case in point: Frank Herbert's DUNE. In DUNE, people should not have been able to live unprotected upon the surface of the planet Arrakis. There was virtually no water, of which the human body needs 70% availability; and there should not have been enough oxygen. Herbert gets around this with the great BS device of the worms being the source of the oxygen on the planet. When it comes to new worlds, a writer must, either know the laws of physics and what the human organism can tolerate, or come up with some really creative BS that can make the reader believe the world is plausible. 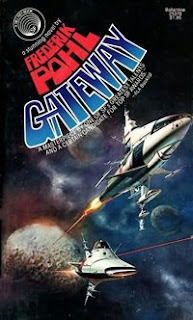 Reading Frances’ comment reminded me about one of my favorite SF books ever—Frederik Pohl’s GATEWAY. The premise: Mysterious alien race leaves behind thousands of operational starships in a hollowed out asteroid, and one day an Earth explorer discovers them. Trouble is, no one can predict the crafts’ preprogrammed destinations, which means that every trip could lead to either destitution, fabulous wealth, or a tragic death. Now some may question the credibility of the science elements in this book, and they’d have a point, or two, or three. But my, um, point is that I thought Pohl crafted such a compelling set-up that for me, the Heechee technology became a “great BS device.” Entirely plausible, and even after multiple readings, never did I question the technology in the story. With GATEWAY, I will probably always view the book through rose-colored glasses because it made such an impact on me. I still feel an intense sense of wonder about the story, and about the consequences humans faced as a result of their decisions when interacting with the technology. Nowadays, I’m a more seasoned reader, and like my gal Frances, I prefer to read a story that demonstrates at least a basic understanding of science (whichever branch applies) or includes a “great BS device.” I also tend to enjoy stories more if a clear affection for science shines through. Doesn’t have to take up whole chapters, but nailing the details can separate a good book from a mediocre one. On a related note, there was a nifty Mind Meld on this topic at SFSignal: Do science fiction authors have an obligation to be scientifically accurate with their stories? Is there a minimum level of accuracy an author should adhere to? As the Mind Meld discussion shows, there are scientific flaws in books all along the SF sub-genre continuum. However, when readers level criticisms at science fiction romance, some inevitably relate to a lack of scientific credibility or “internal logic.” Of course, many of the stories don’t suffer for it (sometimes because of the presence of a “great BS device”), but others do. Now I ask, what author wants readers pulled out of his/her story? This plays into the reputation and respectability issue as well. I can certainly understand if romance isn’t one’s preference, but if readers are turned off of SFR (whatever the specific blend of science fiction & romance) because of problematic speculative elements, then it seems to me worthwhile to explore the issue. Therefore, I wonder, to what extent do present and future SFR authors have a responsibility to aim for scientific accuracy or a well crafted BS device? Is there an onus for them to demonstrate that this sub-genre can master both the science and the romance? As I write this, the historical romance genre comes to mind. Readers often discuss the difference between books involving accurately portrayed historical details and “wallpaper” historicals. Interesting parallel, I’d wager. It’s a thorny issue, and I welcome your input.